The College of Architecture and Environmental Design at Kent State University is preparing the next generation of AEC professionals studying architecture, construction management, interior design, landscaping and urban design. The 107,000 square-foot building houses design studios, building technology laboratories, a lecture hall, library, classrooms, café and is topped off with a green roof. 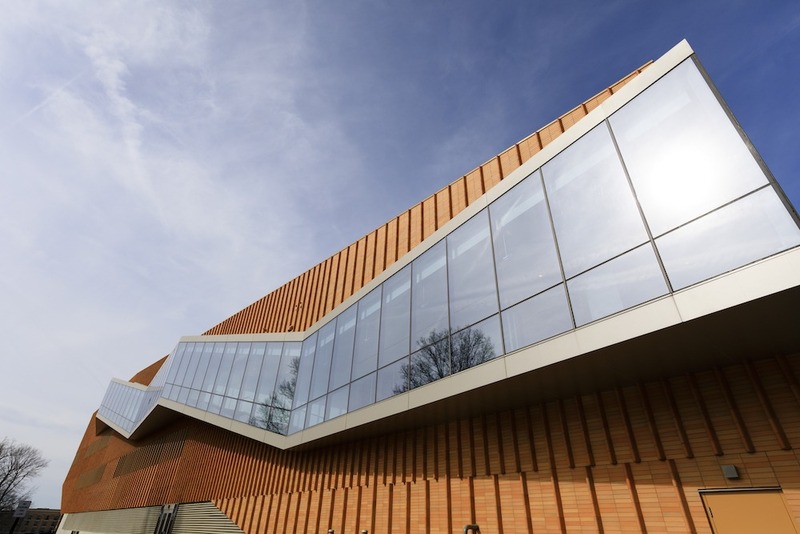 While the stunning exterior is drawing attention in the design community, the building’s enclosure solutions are quietly addressing three key challenges: moisture mitigation, thermal performance and sustainability. To address each challenge, the enclosure team employed a system performance approach. As the name implies, a system approach evaluates how each element of the enclosure performs in conjunction with other elements. For example, insulation must be considered in terms of thermal and moisture performance, but also in context with how it functions with air/water barriers and limiting fire propagation in the enclosure. The design team selected the pre-engineered Owens Corning® Enclosure Solutions for the masonry steel stud wall assembly. Following is how each element supported key challenges. Regardless of the form it takes, moisture is a pervasive threat. The closed cell, moisture-resistant rigid nature of the Rigid Foam Insulation used as continuous insulation keeps steel stud framing warmer in cold conditions, and it is adequately permeable to regulate vapor migration, both of which reduces the likelihood of vapor condensation in the stud cavity. It also resists liquid moisture in masonry wall cavities thus guarding against damage caused by moisture accumulation. Kent Ohio’s Midwestern location is subject to humid summers and bone-chilling winters. Again, insulation plays an important role in minimizing the effects of thermal bridging. The insulation used delivers long-term stable insulating performance at R-5 per inch. 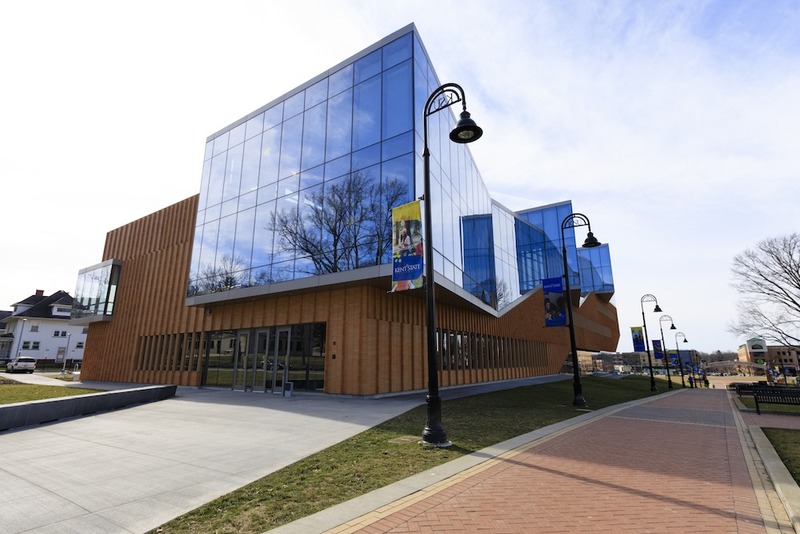 Given that Kent State College of Architecture is educating future environmental design professionals, the materials selected for the enclosure had to support sustainability. With a minimum of 20 percent recycled content, FOAMULAR® 250 insulation helped the building attain a LEED® Platinum rating, the highest available under the U.S. Green Building Council’s LEED® program. It’s All about the System: The exterior wall system included other products documented as a wall “system” to be code compliant and compatible. These additional components include Pos-I-Tie® masonry veneer anchors from Heckmann Building Products Inc., MortarNet® mortar dropping protection from Mortar Net Solutions™, and Grip-Deck™ continuous insulation anchors with Thermal-Grip® ci prong washers from Rodenhouse, Inc. and one of the dozens of water/air barriers that are pre-approved NFPA 285 compliant with Owens Corning® Enclosure Solutions. While the system approach was designed to support building performance, it also underscores another important lesson AEC professionals learn – time is money. The streamlined approach to selecting compatible and rated products provided an added layer of efficiency and value for the AEC team working on the project. With Owens Corning Enclosure Solutions, the design team gained time-saving access to specification guides, CAD and BIM drawing files and other necessary documentation required to demonstrate compliance. As students at the Kent State College of Architecture and Environmental Design prepare for careers in the AEC industry, their learning environment addresses challenges they will face in their careers.